If you are planning an extensive trip around South America, chances are you are including Salar de Uyuni in your itinerary. The largest salt flat in the world, located in Bolivia, is indeed pretty spectacular and shouldn’t be missed, particularly if you are into nature and adventure related activities. 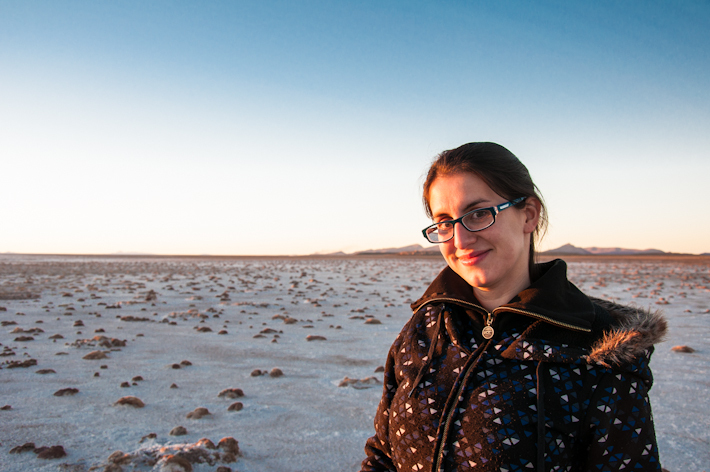 But how to go about organizing a trip to the salar? Adventure companies tend to promote 3 and 4 day packages that include not only the salt flat per se but also the areas around it. But what if you don’t have that many days or do not wish to spend 4 days out of your traveling time just around this one location? Would you be missing out? Well, it depends!.. If you are traveling around the south of Bolivia but also plan to visit the north of Chile (or you’re actually coming from there itself, like many do! 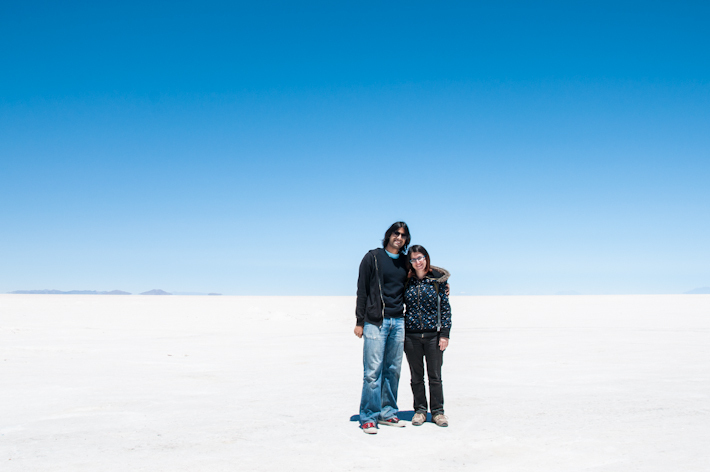 ), then 1 day in Uyuni is more than enough to see and enjoy what this place is all about. The 4 day jeep tours are not for everyone: the accommodation you’ll find along the way is basic, it can get cold during certain times of the year, and you never know if you’re going to appreciate your driver’s skills (I’ve read way too many horror stories). Apart from this, the Atacama desert in Chile and the areas around Uyuni share a lot of similarities, making it redundant to visit both in a row, unless this is your thing and nothing else is! If you plan to visit the Atacama or come from there, you’ll already see plenty of lagoons, flamingos, geysers and gorgeous landscapes, not so distinct from those included in the places that 3 or 4 day tours around Uyuni will take you to. 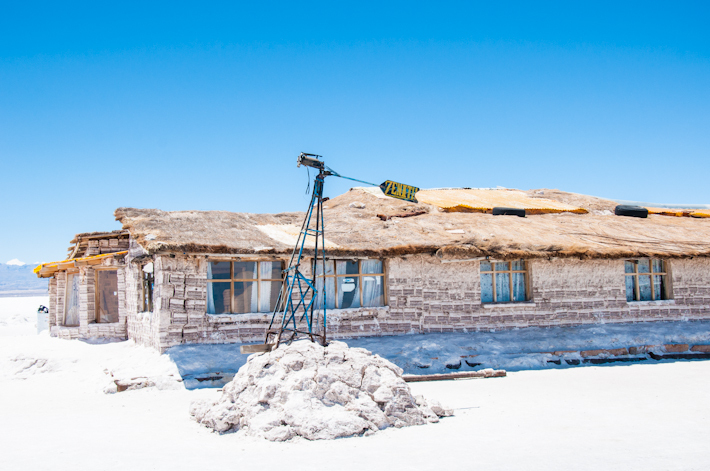 Am I discouraging anyone from staying longer in Uyuni? NO. But if you need to save time or you’re looking for a variety of experiences and if you have already visited Atacama in Chile, then you can head straight for the main thing about the Uyuni tours: the salt flats. - Train cemetery. If you stay near-by the salar like we did, as opposed to in town, you will not be picked-up for this – at least we didn’t! 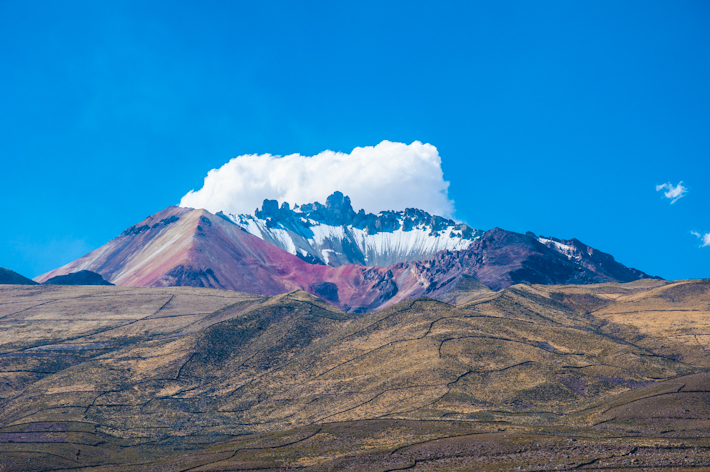 Tunupa Volcano – such earthy colors, it almost looks like it's been painted! "Hey you, stop eating alpaca steaks!" - Ojos del Salar (aka Eyes of Water), where bubbling water comes to the surface breaking the crust of salt. 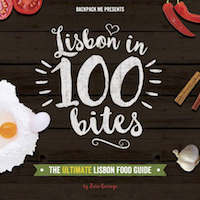 … and still at a leisurely pace! 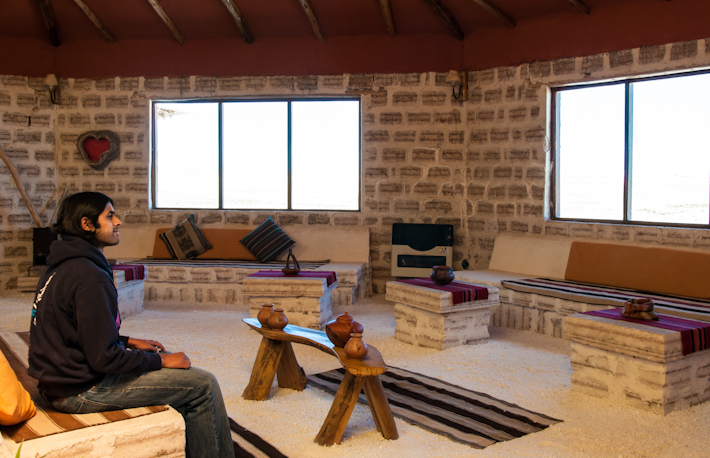 If you do not wish to spend several days driving around but think a day trip is also way too short to enjoy this unique place, then staying at a hotel made of salt right next to the salar is a good option too – and that’s just what we did! That way, you can spend a day driving inside the salar and some more time close by, from where it’s easy to go for walks or biking in and around the salt flat. 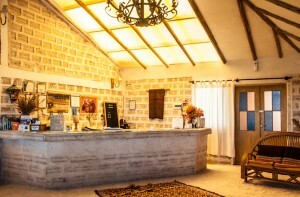 And of course, you get to enjoy a hotel made of salt, which is an attraction on its own! 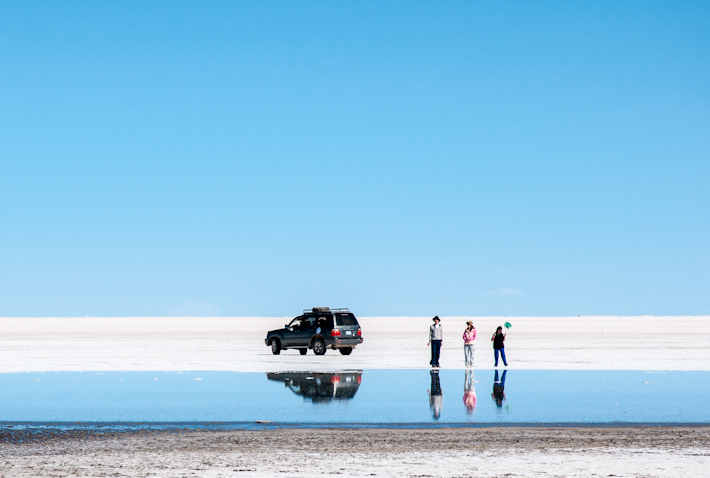 Do keep in mind that the “mirror effect” that you might have seen in popular Uyuni photos doesn’t always happen. Only under optimal conditions you”ll be able to see the sky reflected on the floor, giving the sensation that there is sky both above and under yourself. This is more likely to happen when there has been a little bit of rainfall but not too much either, because in that case accessing the muddy salar can be tricky and the mirror effect would be replaced by a messy effect. 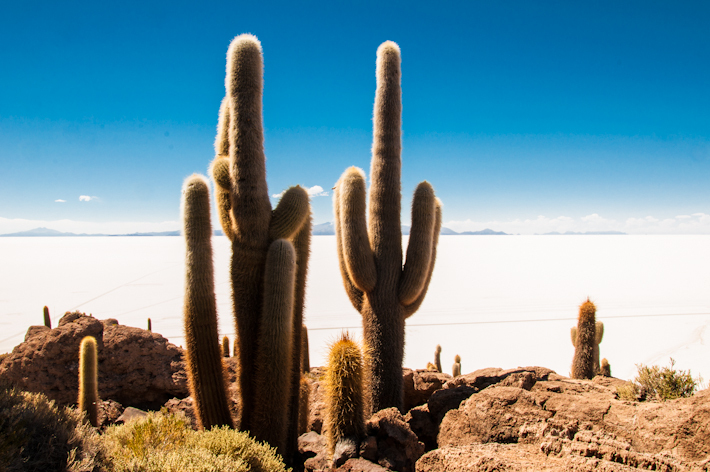 Whatever number of days you stay around, Salar de Uyuni is very likely to give you an “out of this world” feel. The landscape looks like out of a movie – just the kind of thing photography lovers dig! That’s cool. 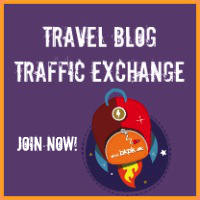 I am working out a 6-month South America trip soon. One quick question, did you get Bolivia visa on the road? I am on the infamous Indian passport as well but live in DC. I will be going to Bolivia from Brazil. 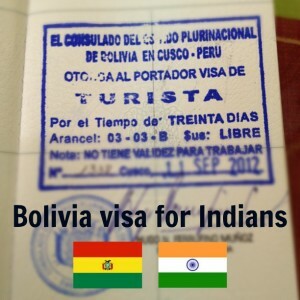 Saw your comment on the article about Bolivian Visa for Indians – glad you got the info you needed! Kudos to you both and a happy married life. 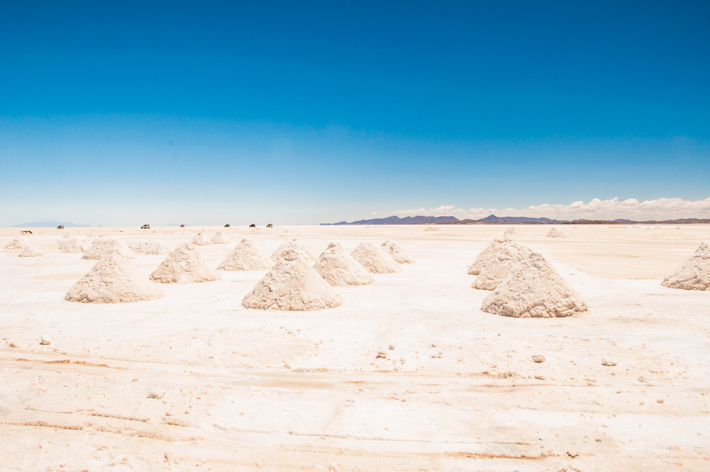 I’m currently in San Pedro now and really eager to visit the Uyuni salt flats but the itinerary of the 4 days tour is really in attractive to me. 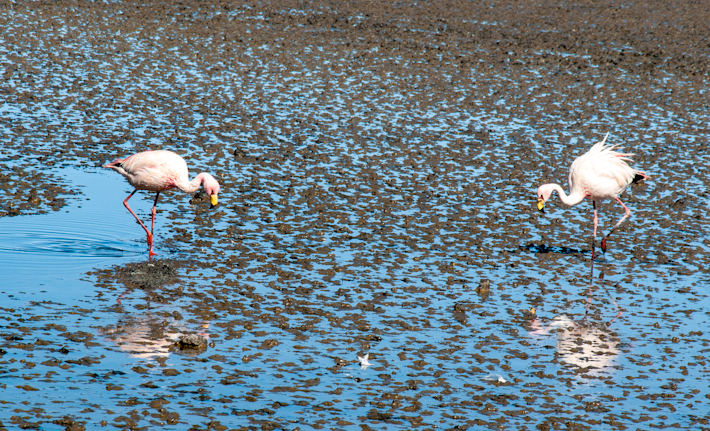 Like you said, I have already seen a lot of lagoons, flamingos and geysers and I Only wanna go to uyuni for one reason – the worlds largest salt flats. 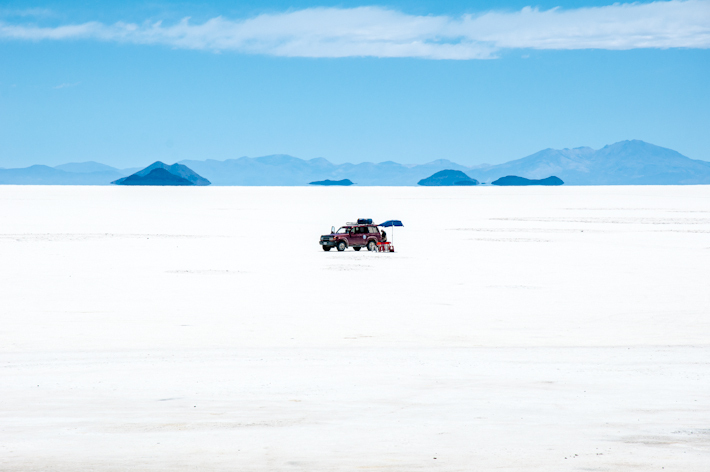 Do you terribly mind sharing your transportation method from San pedro to uyuni? I’m looking into buses now but seems they only have it two days a week and doesn’t fit my schedule. Many thanks! Hi Sibs! Awesome! San Pedro is such a beautiful place. I bet you’re enjoying staring at the stars! We didn’t actually go to Uyuni from San Pedro. Our plans took us to Peru and then Bolivia on a much later date. We ended up taking the train from La Paz to Uyuni (a beautiful journey by the way)! 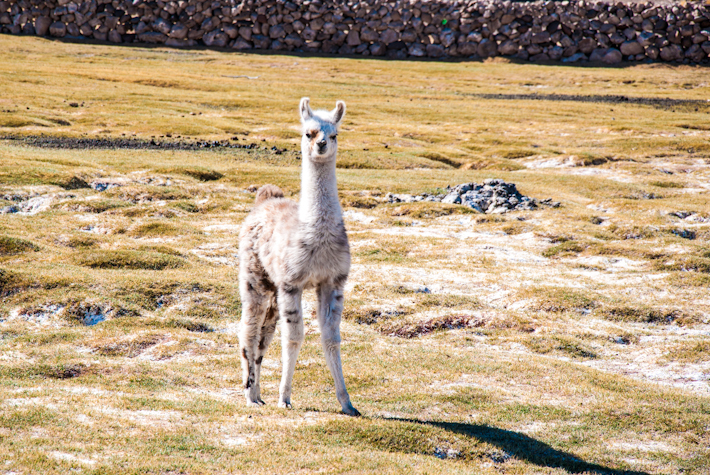 Since you’re not into the tour, bus would still be your best option to get to Uyuni. You might be able to go to Calama and get a bus across to Uyuni as well but I’d suggest you check into that online first. Just to xcheck my understanding. 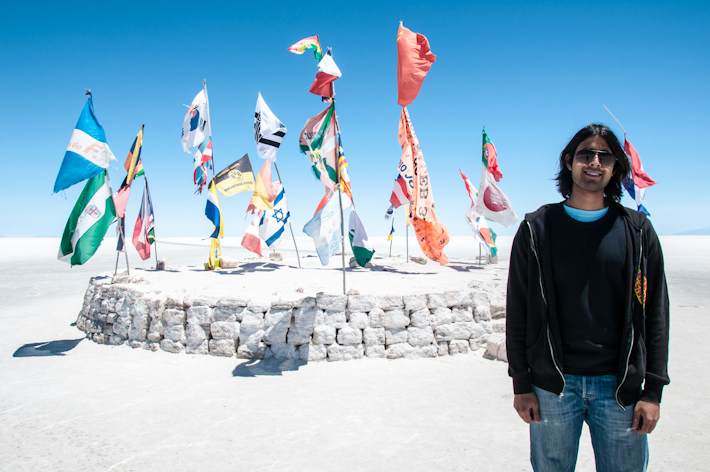 I can do a oneday trip to Uyuni salt flat from San Pedro, but I need to go to Calama first. 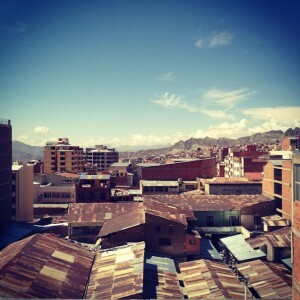 Then I take a bus to Uyuni town. And then to get to the salt flat somehow. Is it what you say? I assume I misunderstood you, because it seems to me complicated and can’t imagine to manage it in one day (assuming I would want to return to San Pedro on the same day). Thanks a lot! would you recall what company did you do the tour with? Which tour company do you choose finally and how much does it cost for the one day tour? We ended up booking with the hotel we were staying at, this one: http://bkpk.me/salty-dreams-at-luna-salada-hotel/ But in the 4×4 durng the tour we were mixed from people from different companies. I think for the day trip things don’t vary that much, and people from different tour agencies end up being mixed to fill up the vehicles. I am sorry, but I don’t remember the price for the 1 day tour. Shop around in the town center.. the rate will definitely be better than at the hotel!